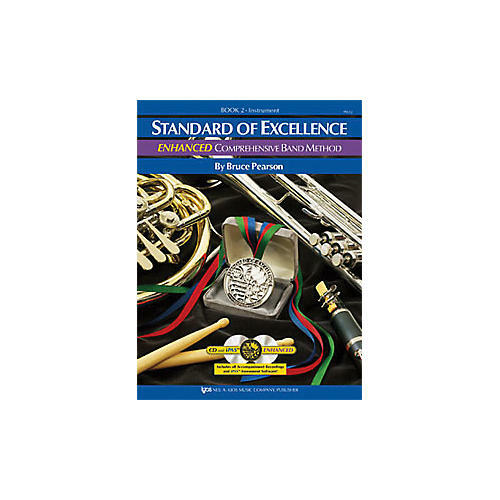 The Standard of Excellence ENHANCED Comprehensive Band Method Books 1 and 2 combines a strong performance-centered approach with music theory, music history, ear training, listening, composition, improvisation, and interdisciplinary and multicultural studies. Each book comes with online audio containing all the full band accompaniments and the revolutionary iPAS Practice and Assessment Software. Directors will welcome the complete accompaniments and inspiring software. Students will find the new package makes practicing not only fun but effective, too! The result is the most complete band method available anywhere. Also available are the 600-plus page full Conductor Scores for Books 1 and 2 containing Objectives for every line of music, Director tips, extended reference articles, duplicable worksheets and quizzes, and theory, listening, composing, improvisation, geography, foreign language, history, and other interdisciplinary Activities for Excellence. The iPAS Teacher´s Edition (sold separately) gives directors the ultimate objective assessment and record-keeping tools.